Returning for the second time in 2018, Hyper festival is back and set to take over Midland on December 8 with a jam-packed program of talent and loads of entertainment. City of Swan Mayor David Lucas said Perth’s best all-ages festival will feature a huge line-up of stunning local and national artists, headlined by DZ Deathrays and Polish Club. “Joining the Hyper set for the first time will be interstate artists Ruby Fields (NSW), Kira Puru (VIC), Polaris (NSW), Alpha Wolf (VIC), Justice for the Damned (NSW), Antonia and the Lazy Susans (NSW), Aburden (VIC), Eilish Gilligan (VIC), Househats (VIC) and Approachable Members of Your Local Community (VIC),” he said. “Local heroes Sam Perry (winner of The Voice), Good Doogs, Mosquito Coast, Your Girl Pho, Vacant Home, Homebrand, Hell Average, Mal De Mer, Sad Hour, Tether and Holographic Moon Society will also be joining the festival’s line-up on the day and local DJs will also be on the decks all day in the silent disco, with DJ applications open now. Midland/Guildford Ward Councillor Ian Johnson said Hyper continued to be Perth’s biggest and best drug, smoke and alcohol-free all-ages festival. “The Hyper festival is hugely successful every year, and I look forward to seeing another impressive turnout this December,” he said. The festival - supported by Lotterywest and Moshtix - is an all-ages (12+) drug, smoke and alcohol free event. 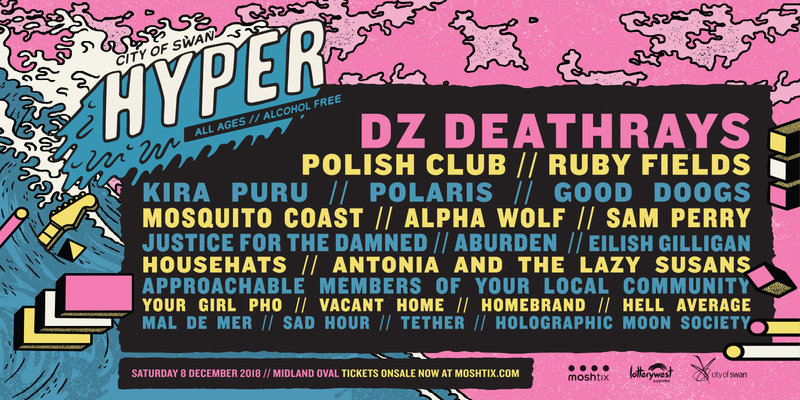 Check out the line-up for Hyper 2018 featuring DZ Deathrays, Polish Club, Ruby Fields, Kira Puru, Polaris, Good Doogs, Mosquito Coast and heaps more!